Magnesium Sulfate Injection, USP is a sterile solution of magnesium sulfate heptahydrate in Water for Injection, USP administered by the intravenous or intramuscular routes as an electrolyte replenisher or anticonvulsant. Must be diluted before I.V. use. May contain sulfuric acid and/or sodium hydroxide for pH adjustment. The pH is 6.0 (5.5 to 7.0). The 50% concentration has an osmolarity of 4.06 mOsmol/mL (calc.). Magnesium Sulfate, USP heptahydrate is chemically designated MgSO4 7H2O with molecular weight of 246.48 and occurs as colorless crystals or white powder freely soluble in water. Magnesium (Mg++) is an important cofactor for enzymatic reactions and plays an important role in neurochemical transmission and muscular excitability. As a nutritional adjunct in hyperalimentation, the precise mechanism of action for magnesium is uncertain. Early symptoms of hypomagnesemia (less than 1.5 mEq/liter) may develop as early as three to four days or within weeks. Magnesium prevents or controls convulsions by blocking neuromuscular transmission and decreasing the amount of acetylcholine liberated at the end plate by the motor nerve impulse. Magnesium is said to have a depressant effect on the central nervous system (CNS), but it does not adversely affect the mother, fetus or neonate when used as directed in eclampsia or pre-eclampsia. Normal plasma magnesium levels range from 1.5 to 2.5 mEq/liter. As plasma magnesium rises above 4 mEq/liter, the deep tendon reflexes are first decreased and then disappear as the plasma level approaches 10 mEq/liter. At this level respiratory paralysis may occur. Heart block also may occur at this or lower plasma levels of magnesium. Serum magnesium concentrations in excess of 12 mEq/L may be fatal. Magnesium acts peripherally to produce vasodilation. With low doses only flushing and sweating occur, but larger doses cause lowering of blood pressure. The central and peripheral effects of magnesium poisoning are antagonized to some extent by intravenous administration of calcium. With intravenous administration the onset of anticonvulsant action is immediate and lasts about 30 minutes. Following intramuscular administration the onset of action occurs in about one hour and persists for three to four hours. Effective anticonvulsant serum levels range from 2.5 to 7.5 mEq/liter. Magnesium is excreted solely by the kidney at a rate proportional to the plasma concentration and glomerular filtration. Magnesium Sulfate Injection, USP is suitable for replacement therapy in magnesium deficiency, especially in acute hypomagnesemia accompanied by signs of tetany similar to those observed in hypocalcemia. In such cases, the serum magnesium (Mg++) level is usually below the lower limit of normal (1.5 to 2.5 mEq/liter) and the serum calcium (Ca++) level is normal (4.3 to 5.3 mEq/liter) or elevated. Magnesium Sulfate Injection, USP is also indicated as a parenteral anticonvulsant for the prevention and control of seizures (convulsions) in severe toxemia of pregnancy. It effectively prevents and controls the convulsions of eclampsia without producing deleterious depression of the central nervous system of the mother or infant. However, other effective drugs are available for this purpose. Intravenous use in eclampsia should be reserved for immediate control of life-threatening convulsions. Because magnesium is removed from the body solely by the kidneys, the drug should be used with caution in patients with renal impairment. Urine output should be maintained at a level of 100 mL or more during the four hours preceding each dose. Monitoring serum magnesium levels and the patientâ€™s clinical status is essential to avoid the consequences of overdosage in toxemia. Clinical indications of a safe dosage regimen include the presence of the patellar reflex (knee jerk) and absence of respiratory depression (approximately 16 breaths or more/minute). When repeated doses of the drug are given parenterally, knee jerk reflexes should be tested before each dose and if they are absent, no additional magnesium should be given until they return. Serum magnesium levels usually sufficient to control convulsions range from 3 to 6 mg/100 mL (2.5 to 5 mEq/liter). The strength of the deep tendon reflexes begins to diminish when magnesium levels exceed 4 mEq/liter. Reflexes may be absent at 10 mEq magnesium/liter, where respiratory paralysis is a potential hazard. An injectable calcium salt should be immediately available to counteract the potential hazards of magnesium intoxication in eclampsia. 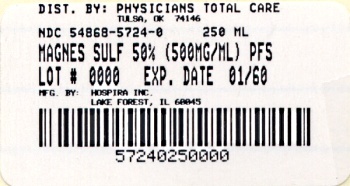 50% Magnesium Sulfate Injection, USP must be diluted to a concentration of 20% or less prior to I.V. infusion. Rate of administration should be slow and cautious, to avoid producing hypermagnesemia. The 50% solution also should be diluted to 20% or less for intramuscular injection in infants and children. CNS Depressants â€” When barbiturates, narcotics or other hypnotics (or systemic anesthetics), or other CNS depressants are to be given in conjunction with magnesium, their dosage should be adjusted with caution because of additive CNS depressant effects of magnesium. CNS depression and peripheral transmission defects produced by magnesium may be antagonized by calcium. Neuromuscular Blocking Agents â€” Excessive neuromuscular block has occurred in patients receiving parenteral magnesium sulfate and a neuromuscular blocking agent; these drugs should be administered concomitantly with caution. Cardiac Glycosides â€” Magnesium sulfate should be administered with extreme caution in digitalized patients, because serious changes in cardiac conduction which can result in heart block may occur if administration of calcium is required to treat magnesium toxicity. When administered by continuous intravenous infusion (especially for more than 24 hours preceding delivery) to control convulsions in toxemic mothers, the newborn may show signs of magnesium toxicity, including neuromuscular or respiratory depression. See OVERDOSAGE. The adverse effects of parenterally administered magnesium usually are the result of magnesium intoxication. These include flushing, sweating, hypotension, depressed reflexes, flaccid paralysis, hypothermia, circulatory collapse, cardiac and central nervous system depression proceeding to respiratory paralysis. Hypocalcemia with signs of tetany secondary to magnesium sulfate therapy for eclampsia has been reported. Magnesium intoxication is manifested by a sharp drop in blood pressure and respiratory paralysis. Disappearance of the patellar reflex is a useful clinical sign to detect the onset of magnesium intoxication. In the event of overdosage artificial ventilation must be provided until a calcium salt can be injected intravenously to antagonize the effects of magnesium. Both intravenous and intramuscular administration are appropriate. Intramuscular administration of the undiluted 50% solution results in therapeutic plasma levels in 60 minutes, whereas I.V. doses will provide a therapeutic level almost immediately. The rate of I.V. injection should generally not exceed 150 mg/minute (1.5 mL of a 10% concentration or its equivalent), except in severe eclampsia with seizures (see below). In the treatment of mild magnesium deficiency, the usual adult dose is 1 g, equivalent to 8.12 mEq of magnesium (2 mL of the 50% solution) injected intramuscularly every six hours for four doses (equivalent to a total of 32.5 mEq of magnesium per 24 hours). For severe hypomagnesemia, as much as 250 mg (approximately 2 mEq) per kg of body weight (0.5 mL of the 50% solution) may be given intramuscularly within a period of four hours if necessary. Alternatively, 5 g, (approximately 40 mEq) can be added to one liter of 5% Dextrose Injection, USP or 0.9% Sodium Chloride Injection, USP for slow intravenous infusion over a three-hour period. In the treatment of deficiency states, caution must be observed to prevent exceeding the renal excretory capacity. In total parenteral nutrition, maintenance requirements for magnesium are not precisely known. The maintenance dose used in adults ranges from 8 to 24 mEq (1 to 3 g) daily; for infants, the range is 2 to 10 mEq (0.25 to 1.25 g) daily. In severe pre-eclampsia or eclampsia, the total initial dose is 10 to 14 g of magnesium sulfate. Intravenously, a dose of 4 to 5 g in 250 mL of 5% Dextrose Injection, USP or 0.9% Sodium Chloride Injection, USP may be infused. Simultaneously, intramuscular doses of up to 10 g (5 g or 10 mL of the undiluted 50% solution in each buttock) are given. Alternatively, the initial intravenous dose of 4 g may be given by diluting the 50% solution to a 10 or 20% concentration; the diluted fluid (40 mL of a 10% solution or 20 mL of a 20% solution) may then be injected intravenously over a period of three to four minutes. Subsequently, 4 to 5 g (8 to 10 mL of the 50% solution) are injected intramuscularly into alternate buttocks every four hours, depending on the continuing presence of the patellar reflex and adequate respiratory function. Alternatively, after the initial I.V. dose, some clinicians administer 1 to 2 g/hour by constant I.V. infusion. Therapy should continue until paroxysms cease. A serum magnesium level of 6 mg/100 mL is considered optimal for control of seizures. A total daily (24 hr) dose of 30 to 40 g should not be exceeded. In the presence of severe renal insufficiency, the maximum dosage of magnesium sulfate is 20 grams/48 hours and frequent serum magnesium concentrations must be obtained. In counteracting the muscle-stimulating effects of barium poisoning, the usual dose of magnesium sulfate is 1 to 2 g given I.V. For controlling seizures associated with epilepsy, glomerulonephritis or hypothyroidism, the usual adult dose is 1 g administered I.M. or I.V. In paroxysmal atrial tachycardia, magnesium should be used only if simpler measures have failed and there is no evidence of myocardial damage. The usual dose is 3 to 4 g (30 to 40 mL of a 10% solution) administered I.V. over 30 seconds with extreme caution. For reduction of cerebral edema, 2.5 g (25 mL of a 10% solution) is given I.V.